The 4th International Solar District Heating (SDH) Conference, which had been organised under the auspices of Horizon 2020 project SDHp2m…from Policy to Market on 21/22 September 2016 in Denmark, showed the importance of analysing real-life monitoring data from European SDH plants, with one conference session (Advanced SDH systems II) dedicated exclusively to the topic. These kinds of comparisons enable an understanding of the actual performance of such large collector fields and offer an opportunity for optimising power output and for creating best-practice examples of new plants. For example, the chart displays ten years’ worth of monitoring data from the German plant in Crailsheim, which has met solar yield expectations. Roman Marx from the German Institute of Thermodynamics and Thermal Engineering (ITW) of the University of Stuttgart, said that the average annual solar yield was 2,631 MWh (360 kWh/m²* a), compared to a previous estimate of 2,575 MWh. The solar fraction, however, reached a share of slightly above 40 %, below the expected 50 %. The reason for this lower-than-expected value was a higher total heat demand in the initial estimate, but also a lower usable capacity for seasonal storage, with the maximum storage temperature having been reduced from 80 to 70 °C. The owner of the plant is now considering a partial replacement of the 12-year old solar collectors by more efficient panels. The district heating session also included a report by Samuel Knabl from Austrian research institute AEE INTEC on the monitoring results of 30 of the country’s SDH plants, which had been supported by the national subsidy scheme for large-scale systems. 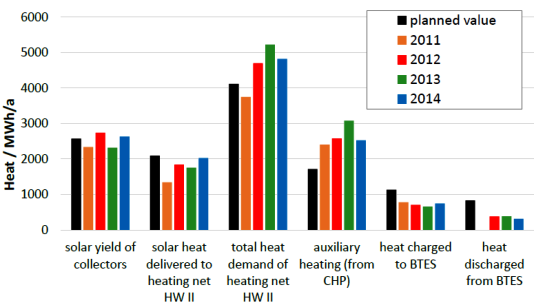 The majority of the 14 systems which completed the monitoring phase almost achieved their expected solar yields; only two installations deviated significantly in their results. 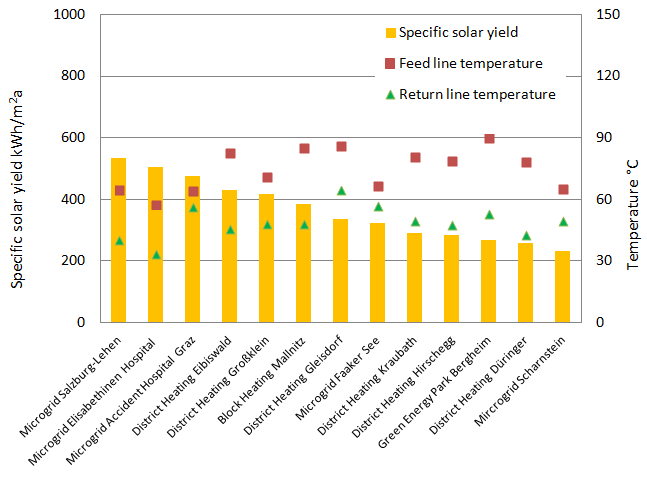 Knabl emphasised the fact that the return temperature of the district heating grid had a significant impact on collector field efficiency, as the above chart shows: specific collector yields ranged from 240 to 520 kWh/m²a. Promising results came in from the biomass-fired district heating plant in Mallnitz, where in summer the peak load operation hours of the oil-fired boiler as well as the operation time of the biomass boilers was significantly reduced. Another example is the suburb of Salzburg-Lehen, where a 2,048 m² collector field heats around 38,000 m² of floor area in flats, a youth hostel, office buildings, a hotel and 150 renovated homes. The solar fraction is 29 %, of which 12 % are directly used in the buildings and 17 % originate from indirect use by the heat pumps, which have a seasonal performance factor of 4.5. Primary technical and performance figures based on 2015 data from three Danish large-scale SDH plants. *102 % of storage efficiency has only been possible because the system used a certain amount of heat from the previous year. The presentation by Thomas Schmidt from German research institute Solites confirmed the often-quoted average annual yield of 400 to 450 kWh/m² for large-scale collector fields in Denmark. Schmidt went through the monitoring data provided by the operators of the three SDH systems in Marstal, Dronninglund and Braedstrup (see the table above). The difference in yield (between 395 and 447 kWh/m²a) was mainly a result of older collectors still being in operation, Schmidt explained. Whereas the 37,600 m² in Dronninglund were installed in 2014, more than half of the 33,000 m² in Marstal had been installed before 2004, while 15,000 m² were added in 2012. In Braedstrup, 8,000 m² of collectors were inaugurated in 2007. This article was written by Riccardo Battisti, solar thermal consultant and market researcher working at Ambiente Italia (Rome, Italy).